1. 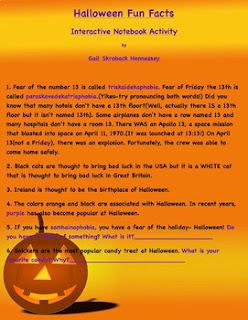 Fear of the number 13 is called triskaidekaphobia. Fear of Friday the 13th is called paraskavedekatriaphobia. (Yikes-try pronouncing both words!) Did you know that many hotels don't have a 13th floor? (Well, actually there IS a 13th floor but it isn't named 13th). Some airplanes don't have a row named 13 and many hospitals don't have a room 13. There WAS an Apollo 13, a space mission that blasted into space on April 11, 1970. (It was launched at 13:13!) On April 13(not a Friday), there was an explosion. Fortunately, the crew was able to come home safely. 2. Black cats are thought to bring bad luck in the USA but it is a WHITE cat that is thought to bring bad luck in Great Britain. 3. Ireland is thought to be the birthplace of Halloween. 4. 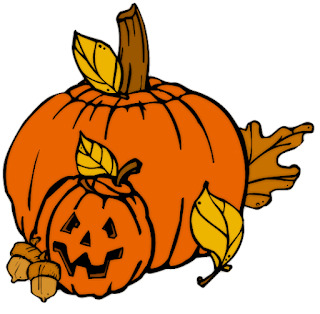 The colors orange and black are associated with Halloween. In recent years, purple has also become popular at Halloween. 6. Snickers are the most popular candy treat at Halloween. What is your favorite candy? Why?____________________________7. Over 35 million pounds of candy corn are made each year! (or 9 billion pieces of the candy). Some estimated that if you placed the kernels sold every year, end to end, the candy corn could circle the earth 4.25 times. 9. There is a Pumpkin Bend, AR, a Tombstone, AZ, a Transylvania County, NC, and a Cape Fear, NC! 11. Halloween dates back about 6,000 years! 12. Did you know there is actually a National Candy Corn Day? It’s October 30th. Find all the nouns you can find in FACT 1. Write all the action verbs you can spot in FACTS 1 and 2. (Use the back of this paper or another sheet of paper. 1. Review Nouns, action verbs and syllables with students before giving the activity to the students. 2. Distribute the Halloween Fun Facts and have students do several of the activities. Regroup and discuss what they have learned about Halloween with the rest of the class. 4.This informative webquest on PUMPKIN would be great for LA classes,a fall activity, or for a substitute lesson!